Phew! It's been a minute since I've written, huh? Spring is in full swing, and I'm in peak chaos! I thought I'd take a minute today to share some of the cool things going on in the garden. The girls in pre-K became intrigued by root vegetables recently. They just love it that some veggies grow underground. (I love how wondrous the world is through a child's eyes!) They decided to plant one of the raised beds on the farm with three different kinds of root vegetables to observe how they grew. The girls planted French breakfast radishes, Easter egg radishes, and Chioggia beets. They came out to the farm almost every day to observe, take pictures, and measure the plants' growth. 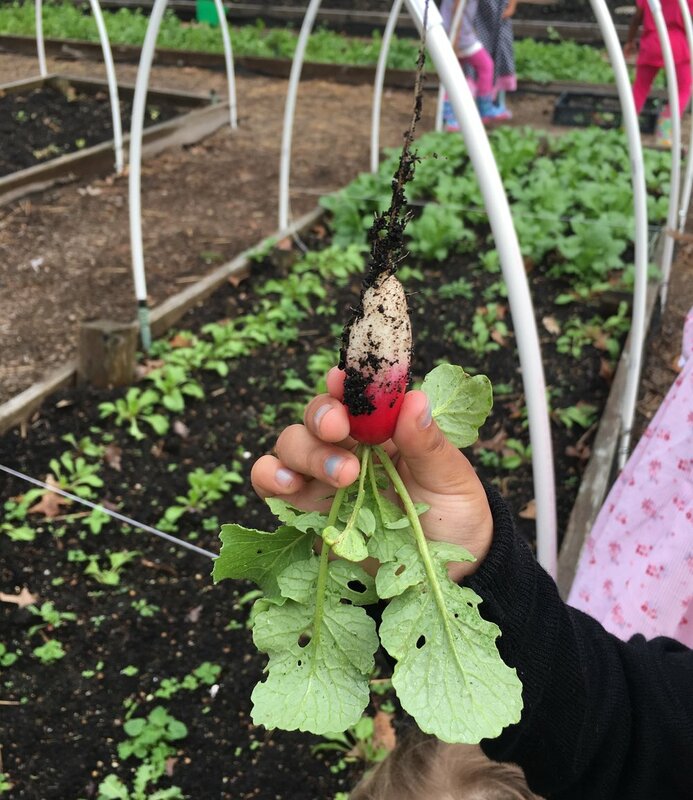 Well, last week the radishes were ready, and they got to pull them up! They loved making predictions about what the radishes would look like before they pulled them out of the ground. That was especially fun to do with the Easter egg radishes, because they were all different colors! The Chioggia beets are still in the ground and will be ready in a few weeks. I've also been working on a cool project with upper school girls. Our sophomore English class read The Things They Carried, which is a novel about the Vietnam War. Many of the scenes take place in rice paddies in Vietnam. To help the girls better understand the setting, we learned about traditional methods of growing rice. We watched videos of rice production, looked at pictures, and then got to start our own rice from seed. The plants are shooting up in our grow light station, and we'll plant them outside next week. This rice is a highland variety, which takes less water to grow than lowland varieties. I've never grown rice before, so I'm looking forward to learning about it more. I'll keep y'all posted! The production and planting schedule is just going gangbusters over here. In the last week, we've harvested hundreds of pounds of leeks, bok choy, radishes, sorrel, arugula, green garlic, herbs. We've planted okra, basil, cantaloupe, cotton, kohlrabi, cosmos, and tomatoes. And the flowers! The flowers are stunning right now. Snapdragons, anemones, bachelor's buttons, nigella, and larkspur are at their peak. It might be chaotic right now, but I wouldn't trade it for anything. It's good to be a grower in April! What's going on in your garden this month? Tell me all about it in the comments or on one of my social media pages!